I had the choice to make a plain sandwich loaf. 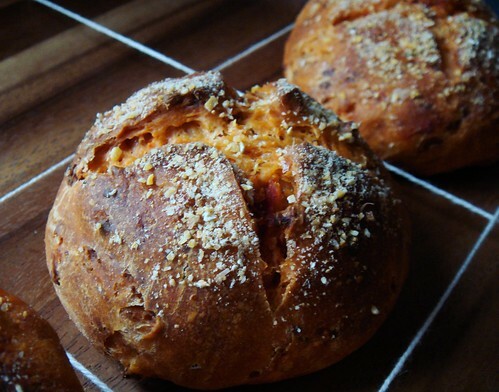 But why go for simplicity when a recipe all pumped up with sundried tomato, Monterey Jack, cheddar, thyme, olive oil, and cornmeal was calling my name? 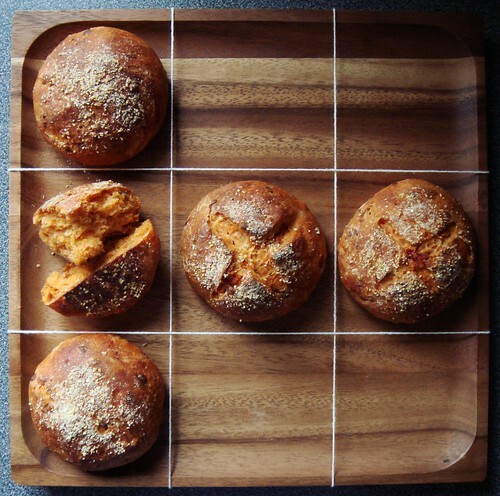 I adapted Dan Lepard’s Polenta Crust Tomato Bread into eight dinner rolls. Four of them I slashed with a decorative cross and four were left untouched. 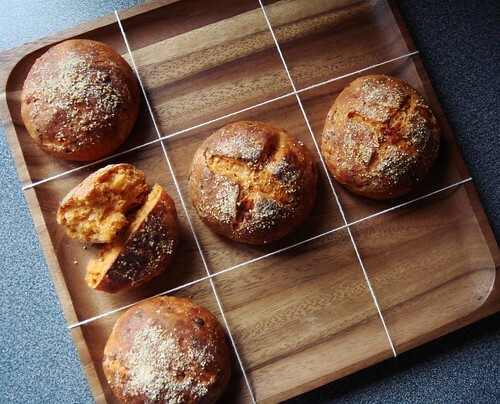 They all baked into mahogany crispy crust perfection but the slashed buns opened up to reveal the cheesy tomato-tinted orange interior. They beckoned like none other…. …for a game of tic tac toe. Who says playing with my food is a bad idea? Well, it is of course a bad idea. Before the game was done, I already impatiently torn into one of the buns. 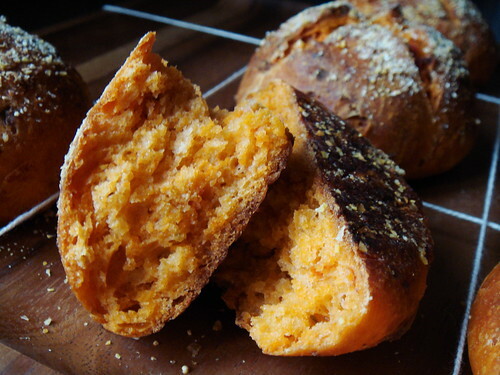 I marvelled at the intensity of flavour and the vivid orange crumb. I loved the smell which oddly reminded me of Subway restaurant (thank you Italian Herb & Cheese). It was not cheesy but the grated cheese made the buns a little flakey. I ate it plain even though they would be perfect for sandwiches. Later in the evening, I found myself flipping through Short & Sweet in search of more bread baking recipes from the limited ingredients I had at home. The Apricot Wheat Germ Loaf is a perennial favourite and I had to summon every once of self control to stop myself from baking. If there is one lesson I learned last year, it is to never start baking bread at 11pm. Otherwise I can say farewell to a good night’s sleep.